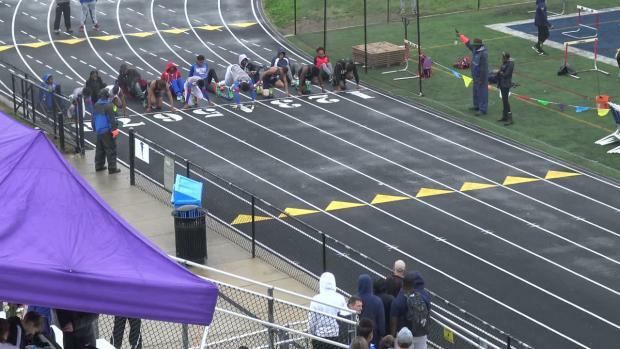 DeMatha Catholic's boys had a big day at the 2018 Bishop Loughlin Games. 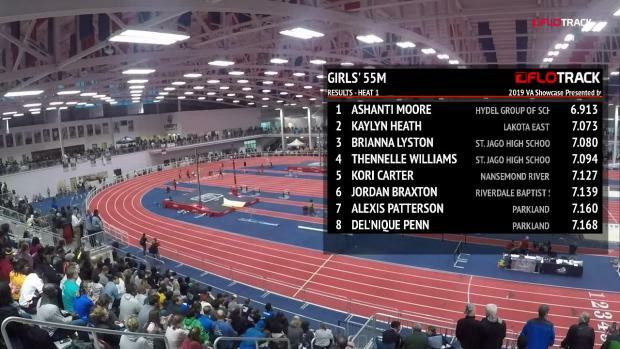 One of the team's most notable performances came in the 4x200m, where it had two relays in the finals and both hit the NBNI Championship standard. The squad's swept the heat in a US No. 2 1:29.32 and US No. 5 1:30.47. The next question this raised was how it stacked up historically to the best early season teams in December, and that's what I'm going to dive into here. 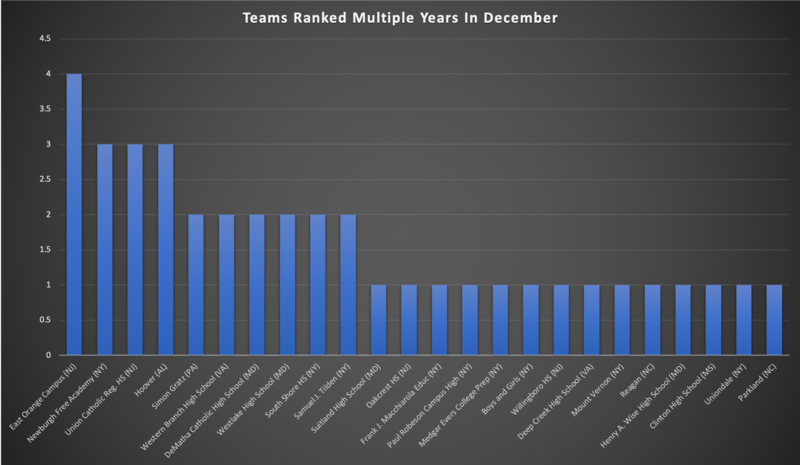 First Question: Were DeMatha Catholic's times good when compared to the best December teams of all time? 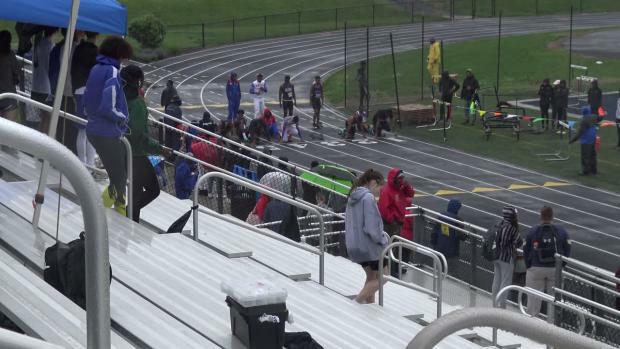 Out of the thousands of 4x200m performances all-time in the MileSplit database, there were only 39 instances where teams ran multiple times at approximately 1:31.5 or faster during December of the same indoor season. This already puts DeMatha Catholic's 2018 boys relay teams in elite company. 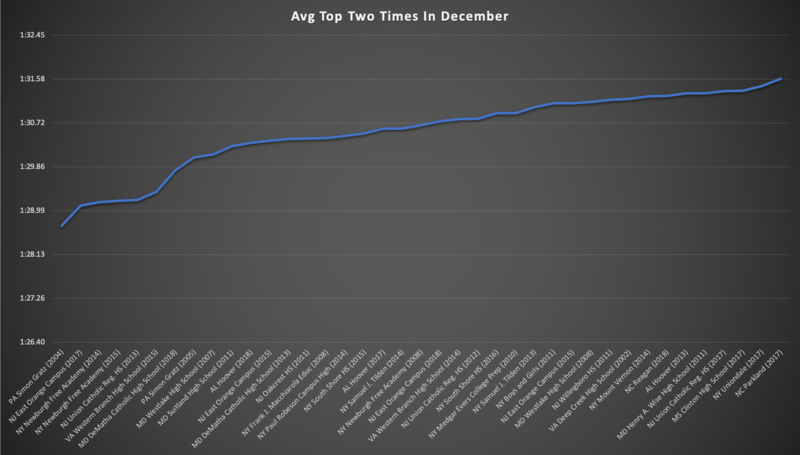 The graph illustrates the average of the fastest two 4x200m December times from each team. A few programs ran three or more on certain years, but two was by far the most common. And this is the second year DeMatha Catholic has delivered a historically significant start to its season, improving its average by 0.63 seconds compared to the 2013 team. Second Question: Where do the 2018 DeMatha Catholic boys rank? DeMatha Catholic's performance at the Bishop Loughlin Games ranks the relay team in the top 10 all-time for December 4x200m teams. The list is led by PA's Simon Gratz in 2004, which is also the only program to average under 1:29.0. It's no surprise to see last year's East Orange team high up on the list after its dominant indoor season. This season's current US No. 1 in the 4x200m (Hoover) are currently sitting at 11th with a 1:31.55 that brings its December average up to 1:30.33. Third Question: Is it common for teams to have strong December openers in multiple years? Another one of my thoughts relative to DeMatha Catholic was to check frequency. If good programs do this every year in December, then maybe it's not as impressive. You often hear good December performances called into question with comments likes "It's too early," "It doesn't matter," and "No one good is racing yet." As you can see on the table, out of the 24 programs who have made the all-time December 4x200m list, less than half have been able to repeat the early-season success on multiple years. Only four have been able to do this more than twice. Simply by looking at the teams included, it's clear that it's not a bunch of random programs gaining notoriety by being the only ones to race early. It includes many of the traditional indoor powerhouse programs. For DeMatha Catholic to be one of the ten teams on this list (out of thousands that race every year) to accomplish this multiple times, it eliminates any doubts associated with early-season performances. Fourth Question: Has any other team accomplished this feat with two separate relays? The 2018 December performances from DeMatha Catholic's boys are legit, and I'm willing to argue with anyone who thinks otherwise. Overall, being successful in December doesn't necessarily indicate that a team is destined for true all-time greatness. Of the top ten 4x200m times in high school history, just three were also part of this December analysis on the same year (Simon Gratz, Union Catholic, Deep Creek). 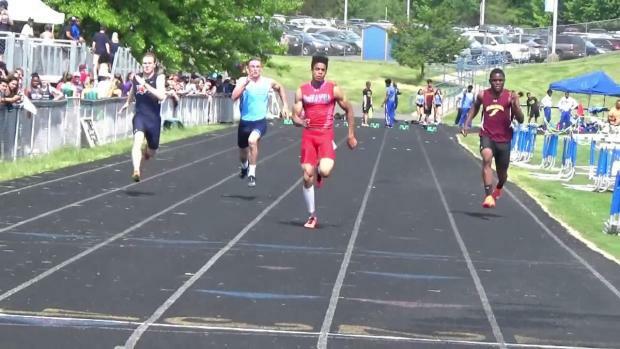 According to my analysis, DeMatha Catholic is the first program in high school history to field two separate relays able to run this fast December. Even with that loss, the team is showing incredible depth and development with its current group. 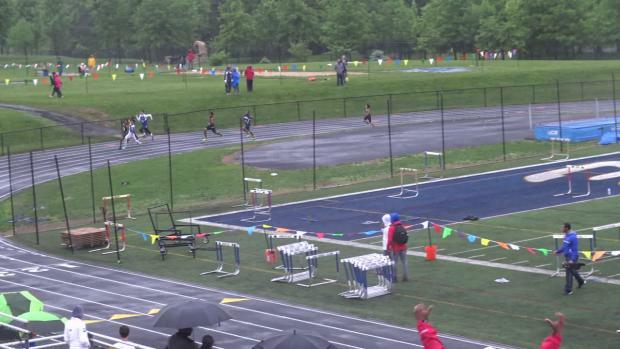 Last year, DC ran 1:30.43 at the Bishop Loughlin Games. This year the squad put two relays at that mark or better, with the 'A' team running over a second faster. Hypothetically speaking, if the team this year improves its Bishop Loughlin time the same amount as last year's relay (2.88s), it would finish the season running 1:26.44. That mark would be good for No. 3 all-time, just behind the Lyles-powered TC Williams squad of 2015. 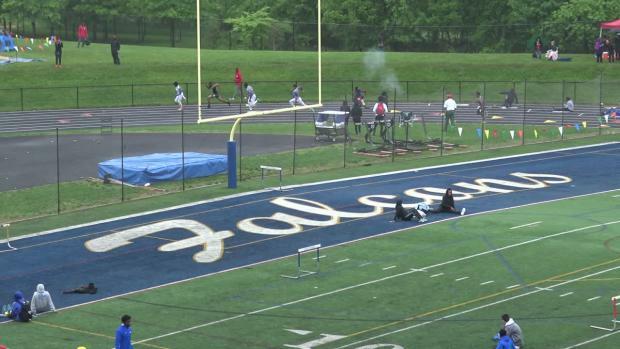 There's still plenty of racing left this season, but there's no doubt that the DeMatha Catholic boys are solidifying themselves as the heir to the throne in the sprint relays. Let us know what you think on Twitter @milesplit & @TravisMillerFlo. If you have a suggestion for the next stats deep dive, email me at travis.miller@flosports.tv.